These are the rose pictures that I really meant to post this morning, but couldn’t because I stupidly didn’t upload the actual pictures. I tell you, my mind just keeps getting leakier and leakier. Maybe I need a vacation? At any rate, click the pics for the close-ups. 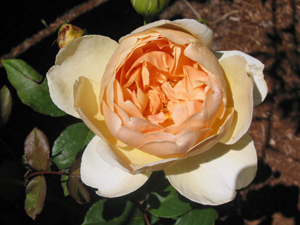 This is the David Austin rose Jude The Obscure. It’s the most beautiful pale yellow changing to apricot in the center. It’s one of the most fragrant roses I know of, with a scent that is sort of fruity, vanilla-ish, rosy. Before this flower even opened, I could smell it from my back door — a good 15 feet away. One blossom can perfume an entire room. 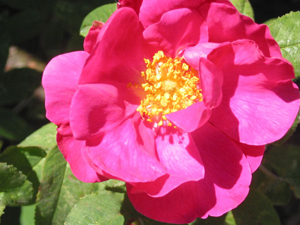 Like many David Austin roses, Jude is hardy and disease resistant. And besides, there just aren’t that many roses named with my name! This is one of my very favorite roses ever — Eyepaint — one of the McGredy “hand-painted” roses. It seems to be getting hard to find, since I had to go to Canada to get it, and I think that’s a shame. It deserves to be more widely grown. A floribunda, it covers itself with smallish flowers for a long blooming period. This picture is a little washed out, at least on my monitor. The petals are actually a very bright fire-engine red with a white center. The reverse of the petals is white, so when the bush is loaded and a breeze blows the blossoms appear to be winking on and off. It always looks so cheerful when I see it out in my garden. I think of it as a “lift your spirits” rose. The roses I planted this spring are blooming, finally. I took some great pictures of flowers this weekend, but since I forgot to upload them to the site server this morning, I won’t be able to post them until later. On the knitting front, I’ve started on new socks for E, and managed to complete about 2″. I’ve shaped the armholes for the sweater and I have about 6″ left to knit on the two fronts and the back. I decided to use a sort of tweedy pattern for my bright Cascade socks, and I’ve cast on and knit most of the toes in bright pink. I’ve written before about Queen Kahuna’s Crazy Toes & Heels book. I like some of her techniques, but others I’m less wild about. I love the way she increases at the beginning of her toes, for example, but I’m less wild about her cast-on because it leaves purl bumps on the outside. I’m a fan of the figure-eight cast on, which is pretty much invisible with no “cute little purl bumps” at all and no grafting. It just seemed to me that there should be a way to combine the figure-8 cast-on with the Queen Kahuna quick-increase method. I’m working on it. I cast on E’s socks using a combined method followed by the Queen Kahuna “fan toe.” I’m fairly well pleased with the result. But I think I can do better. If I come up with a method I really like, I’ll post the results if there is interest. On a totally separate note, fireworks started in my neighborhood at about 6:00 last night, and went non-stop until about 1:30 this morning. Completely non-stop. My street looks like a war zone. I saw things that were in no way even close to being legal. And I saw a lot of people doing really stupid and unsafe things. Luckily nobody was hurt and no buildings were burned down. I’m a fan of fireworks, too — but enough is enough. Next year, how about a little common sense?